Over the holiday break, I received a call from Ted in Apopka asking how he can be sure that the unit we are installing for him will be more efficient than the one he has now. After a few minutes summarizing home dimensions, air flow, and his priorities, the topic of the SEER rating came up. Not surprisingly, Ted said he knew nothing about it. We continued to speak about SEER ratings and, in no time at all, his complete confidence resurfaced as he knew he was in good hands and we would keep him cool. Considering most of our guests are like Ted and unaware of what SEER ratings mean and its impact on your home (not to mention your wallet as well), read on to knowledge and savings! On a side note, even if you don’t go with Tropical Air of Central Florida for your cooling and heating needs, feel confident the information presented will empower you and guide you to the best option. 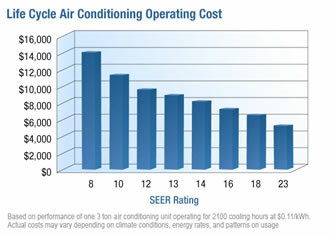 The standard measure of air conditioning efficiency during a “normal” annual cooling season is called SEER, which stands for Seasonal Energy Efficiency Ratio. This, as evidenced by its acronym, will tell you up-front how efficient your system is. How does this information empower you? Glad you asked… When you are shopping for a system, remember: The higher the SEER rating, the higher the efficiency. It’s that simple so don’t let anyone else tell you otherwise. When you add up the savings, it’s difficult to ignore the difference a higher SEER rating can make to your comfort and wallet. Added benefit: Higher SEER ratings have such an impact on the efficiency of your home that you may be in a position to earn tax credits and rebates from power companies, just for upgrading. All this is great news for Ted as he will be receiving a great system (ideal for his needs) at a great price AND a sizeable rebate from his power company for changing from a 12 SEER system to 15 SEER system. Certain Ted will be pleased with his new unit, his cost savings, and his rebates, I encourage you (and your friends) to consider an A/C upgrade of your own. As always, we’re here to help you stay connected with information, enabling you to make decisions that will keep you comfortable while saving money. 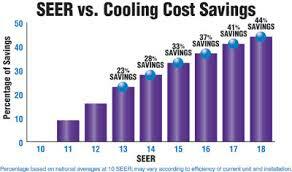 If you have any questions about the SEER rating on your system or other comfort questions, give us a call any time. ← Company Christmas Party: Go or No?